This ad is not shown in any of the Butler Bros. Catalogs we have researched, nor is it in either of the couple of old Imperial Catalogs we own. 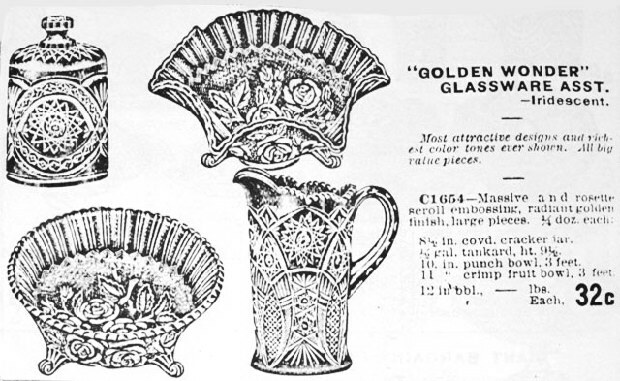 The 1978 Imperial Glass Book by the Archer’s indicates manufacturing dates to be 1910 -1929. 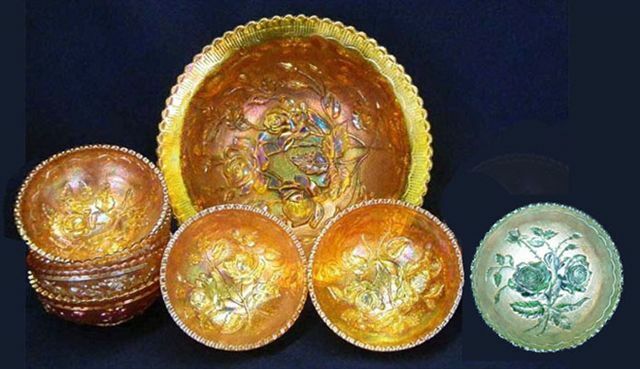 We all know that Imperial Glass produced many variations in shape of both Open Rose and Lustre Rose. In the ‘60s - ‘70s and early ‘80s, reproductions were plentiful, having IG, LIG, and ALIG. Some of the reproductions displaying the open rose within the marie, were possibly made by other glass manufacturers who attained the moulds, removing the former lettering to insert the rose? Sizes of the examples having that rose within the marie are not the same size as the originals known to have been manufactured by Imperial. NOTE: Imperial produced quantities in both Lustre Rose and Open Rose, equal to the variety found in Grape and Cable by Northwood. The variations in the design from one shape to another offers such distinction that each one affords a certain individuality. 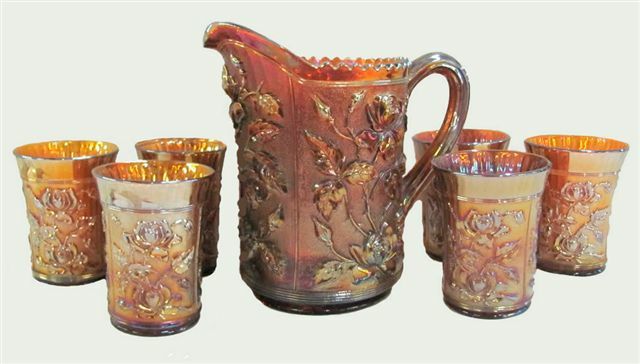 LUSTRE ROSE Water Set: The standard version has a ribbed interior on pitcher and tumbler, with a rayed star molded into the base. Marigold and helios are easily found. The very rare purple sets are often found having brilliant electric iridescence! Amber sets are rarer still! Standard tumblers having the ribbed interior are also known in aqua and olive. There are some rare smoke tumblers as well. LUSTRE ROSE Variant Water Set: has a plain interior and base, lacking both ribbing and the rayed star. Marigold and clambroth are confirmed colors. The Variant tumblers have been documented in marigold, clambroth, aqua, light blue with marigold iridescent overlay, lime green, and a frosty white. 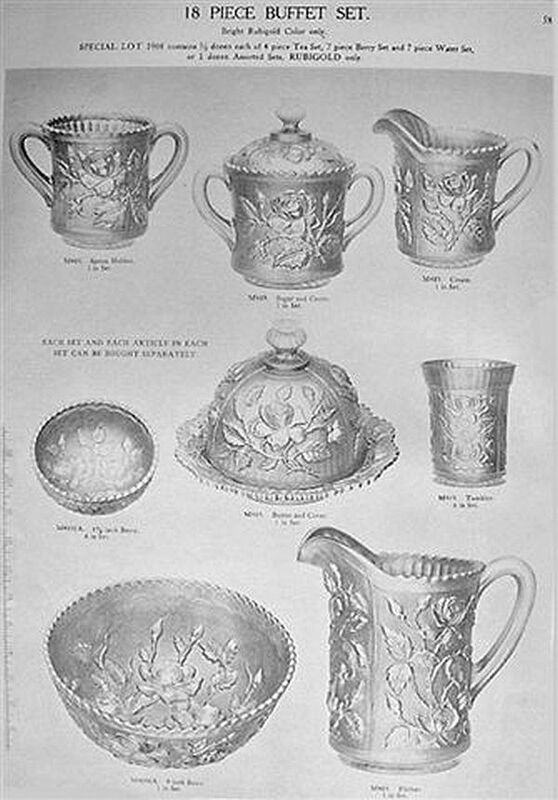 Variant tumblers and pitchers are more difficult to locate than the standard version. 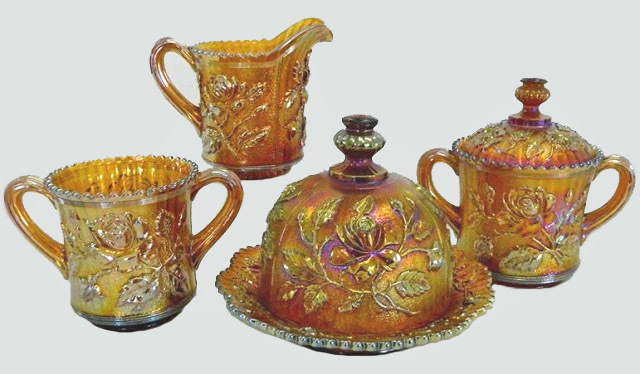 LUSTRE ROSE Table Set: Marigold sets are easily found. Purple sets are seldom seen, but rarer still are the lovely amber table sets. LUSTRE ROSE Fernery in Smoke. LUSTRE ROSE Fernery in Purple and Amberina - 7.25 in. opening. LUSTRE ROSE Fernery in Aqua. LUSTRE ROSE Fernery: Blue examples appear more often than purple and helios! Marigold examples are abundant! Amber, aqua, teal, clambroth, olive, smoke, amberina and a lovely frosty white. White and amberina ferneries are not often found! The fernery measures 7 ¼” across the opening. 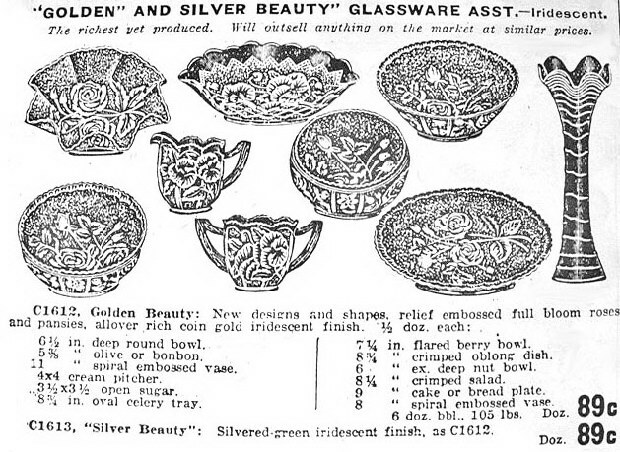 1912 Butler Brothers Wholesale Catalog Ad. This combination of three ads verifies the entry into sales of both Lustre Rose and Open Rose examples at the same time. Butler Brothers Wholesale Catalog ads continued into Aug. 1929. You may view several other examples within these patterns by clicking into -- L -- and -- O -- in our pattern alphabet found on the homepage. 11 in. 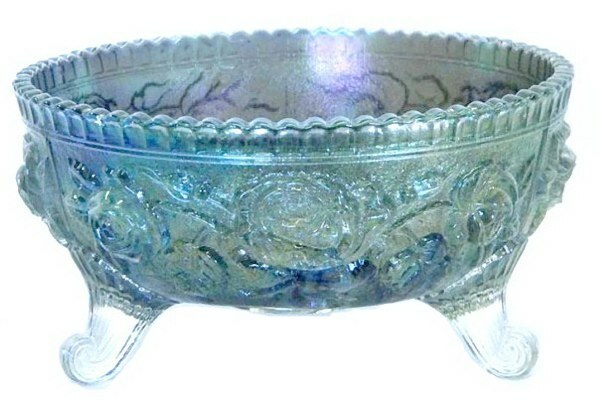 LUSTRE ROSE Fruit Bowl - Exterior is Lustre Rose design, as well - Purple. LUSTRE ROSE Fruit Bowl and Base: Considering the elegance portrayed in this base design, along with the detail offered in the interior design, perhaps now, collectors will reconsider the attributes of this pattern, along with those offered in the companion moulds displaying Open Rose?? Attention to detail and finesse at its finest should lead to a new appreciation of these familiar Imperial patterns. 9 in. Purple OPEN ROSE - Exterior and interior of large berry bowl. OPEN ROSE Berry Set - Marigold and Helios 4.75 in. Small Berry. 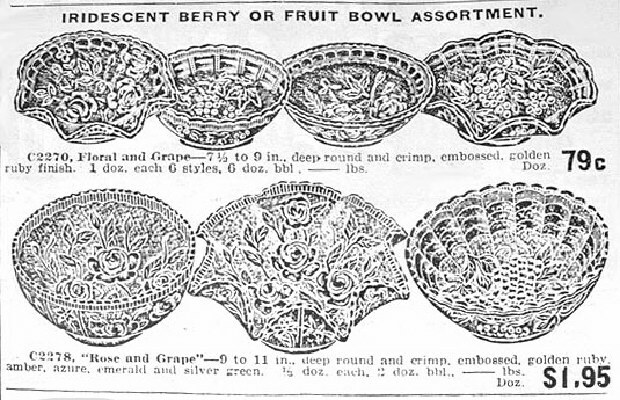 OPEN ROSE BERRY SET: While there may seem to be a large number of colors available in the pattern, it very likely would require some extended effort to accumulate six small bowls to accompany any of the large size berry bowls in a given color. REPRO. OPEN ROSE Plate Smoke (Rose in marie). REPRO. 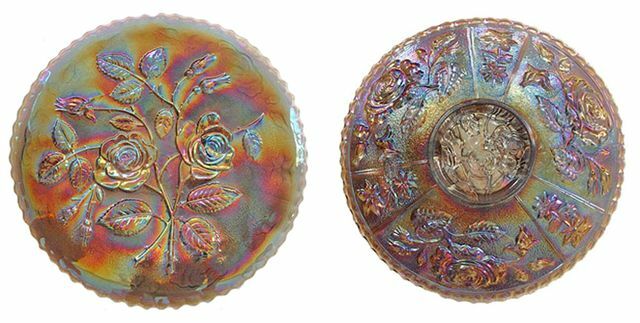 OPEN ROSE Plate: This 10 ½” plate differs from the original 9 3/8” plate. It has a 4” marie with a moulded rose in center. The 9 3/8” plate has a 3” marie without the center rose motif, indicating an entirely different mould. and the Word of God abides in you and you have overcome the wicked one. and the pride of life—is not of the Father but is of the world.